Another good storm cycle for a strip of the western United States, from Tahoe to the Tetons. And of course, the best powder will fall in western Wyoming's mountains this weekend, where temps and elevations are ideal. Powerful Westerly Jet stream carries lots of Pacific moisture across California and the Sierras, unfortunately for that area the freezing levels will be rather high, and snow levels will rise through the weekend, with rain below about the 7,000-ft. elevation, in general. But heavy snow above that elevation, measured in feet! Like 3 or 4 or more! Be happy for the water down there, I guess, which will exceed 4 inches from this cycle through the weekend. Over the Intermountain West, Idaho, western and central mountains do well, and the further north you get the lower the snow levels. 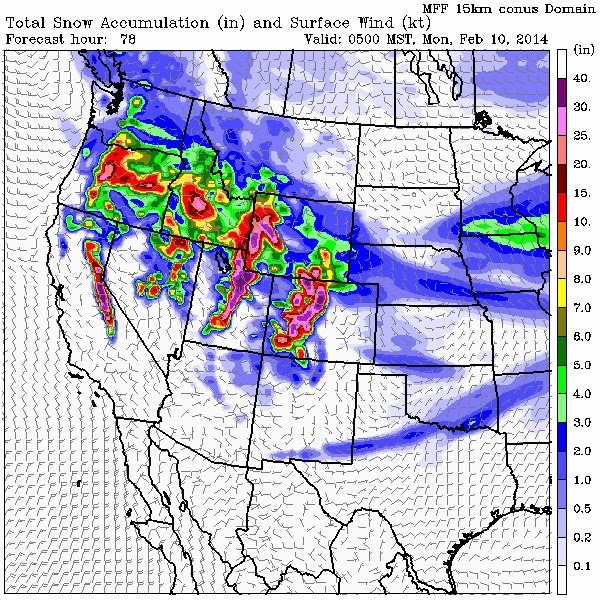 In western Wyoming, a couple of feet of snow accumulation is possible over the weekend for Teton Mountains and a foot in the Hole itself. Looks like another 1.50 to 2 inches of water will be added to the mountain snowpack. The maps below show accumulated snowfall totals and water amounts for the period beginning Friday morning Feb. 7th through Monday morning Feb. 10th. 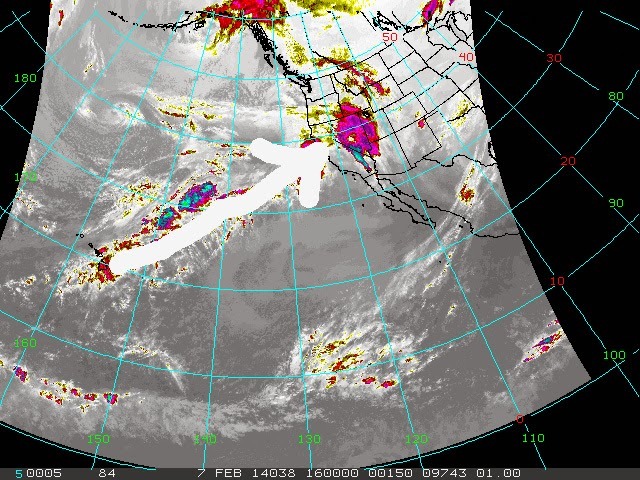 Satellite Photo shows connection of moisture from Hawaii to West Coast, another "Pineapple" connection. Jet stream map shows position of jet across North America on Saturday morning. Te core of that jet that will be right over Idaho and Wyoming at 35,000-ft. will have wind speeds of 170 to almost 200 mph, according to this models prediction. Strongest jet we've seen this winter. February is starting to look really good, with a good scenario for producing snow for the coming weekend and through the end of next week. Jet stream forecast position at Noon MST on Saturday, red zone is over 150 knots 170 mph). Forecast Total Snow Accumulations, Friday morning thru Monday morning. In the "pink is approaching 2 feet. Forecasted Water Amounts for same time period.